Wayne Jordan Co-Founded Akonadi Foundation with his wife, Quinn Delaney in 2000. He currently serves as Secretary-Treasurer of the Board of Directors for the Foundation. Wayne is the founder, President and CEO of Jordan Real Estate Investments. Founded in 1998, Jordan Real Estate Investments is an Oakland-based real estate investment and development firm. The firm takes a long-term approach to investing, and its portfolio includes commercial, residential, mixed-use and industrial investments and development projects in the San Francisco Bay Area, New York and Washington, D.C. In addition to his work in real estate, Wayne is also very active in local, state and national politics. He has been involved in many high-profile campaigns, including hosting fundraisers for Congresswoman Barbara Lee, Speaker Nancy Pelosi, Senator Barbara Boxer and President Barack Obama. 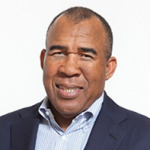 He serves on the boards of SPUR, the Jobs and Housing Coalition, the advisory board of the UC Berkeley Fisher Center For Real Estate and Urban Economics, and is a member of Lambda Alpha International Land Economics Society. An active volunteer in the community, Wayne also serves on the Board of Directors for the Center on Budget and Policy Priorities, Color of Change, Rock the Vote, ACLU Investment Committee, and Citizens for Responsibility and Ethics. When Wayne isn’t busy with work or volunteering in the community, he’s out enjoying a round of golf.